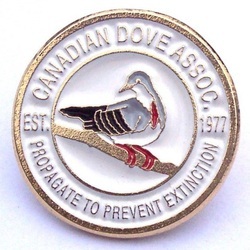 Lapel pins of our crest are available to the members. They are a 1" metal with a butterfly clutch back. The only colour difference between them and our crest is that the colour gold replaces the colour red. To the left a reproduction of the Association's 4" embroidered crest and a 3" vinyl decal. 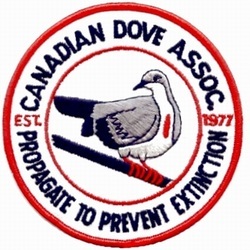 The back-ground is white, the Luzon Bleeding-heart dove is grey with a red patch, the lettering is black, and the crest is trimmed in red.